If you're looking for a charter bus in Encinitas, look no further than San Diego Charter Bus Company. We'll get your group to, from, or around Encinitas for any type of group event. Call us today for wedding shuttles, school field trip transportation, and more! The West Coast is filled with picturesque beach towns like Encinitas. With pristine sand, calm waters, and breathtaking views, Encinitas is the perfect location to plan a group vacation-- especially if you’re looking to get away from the hustle and bustle of San Diego. This quiet city is located about 25 miles north of San Diego and is hailed for being one of the best surf spots in the world. Whether you’re traveling up to Encinitas for a big group surf trip or you’re planning a quaint wedding service at the San Diego Botanic Garden, San Diego Charter Bus Company has a group transportation solution for you. Easily travel to Encinitas from San Diego, Chula Vista, La Mesa, and beyond for a school field trip, private vacation, or any group event. Choose from a compact 18-passenger minibus for your small group outing or a full-sized charter bus that can accommodate up to 56 passengers for your large-scale Encinitas event! Renting a charter bus to Encinitas will offer comfortable and simple transportation for your entire vacation group. Private group transportation services are suitable for both locals and out-of-towners looking to travel around Encinitas for special events like family reunions, social gatherings, and birthday outings. Rather than figuring out the logistics of a carpool caravan or rideshare service, a minibus or charter bus will keep everyone together through your entire trip. Enjoy a group outing to Moonlight State Beach or Swami’s Beach and catch some sun, surf a few waves, or even play volleyball or tennis. A private motorcoach from San Diego Charter Bus Company will have plenty of storage space for beach gear. Each bus will also be equipped with climate-controlled cabins to help your group cool off before heading to another destination. If you’re planning a school field trip, youth group or summer camp outing in Encinitas, a private charter bus will keep students more comfortable than a traditional school bus. Encinitas and the surrounding areas are home to several learning opportunities for students of all ages. Visit the San Elijo Lagoon Ecological Reserve, San Diego Botanic Garden, or even shuttle students to Carlsbad to explore the LEGOLAND California Resort. 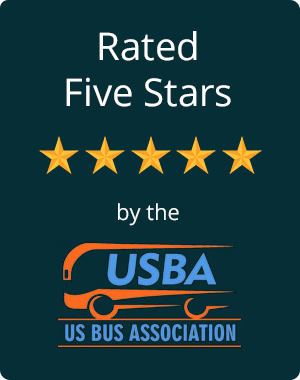 San Diego Charter Bus Company only works with professional and certified bus providers and drivers in the area. Students will not only be safe during their academic travels, but they’ll be able to relax or stay entertained during the trip. The modern motorcoaches we charter include options with amenities like WiFi, entertainment systems, reclining seats, and much more to keep each student content. Are you a San Diego native looking to plan a wedding in Encinitas? Compared to San Diego, this waterfront town offers a calmer atmosphere across a range of venues. Reserving a wedding shuttle service for your guests will ensure each guest makes it to Encinitas without the hassle. San Diego Charter Bus Company will shuttle guests from designated pickup locations in San Diego up to your venue in Encinitas. Plan an intimate wedding at the San Diego Botanical Gardens or a larger service at the beautiful Flower Fields at Carlsbad Ranch. With wedding shuttle service from San Diego Charter Bus Company, guests won’t need to worry about finding the venue or getting lost around Encinitas. Your ceremony and reception will go off without a hitch! Booking your charter bus to Encinitas is quick and easy with San Diego Charter Bus Company. Our team of experienced rental experts are here around the clock to help you find a motorcoach for your trip around Encinitas. We’ll find you the best bus at the right price point for your travel needs. Call us anytime at 619-209-7804 for a free quote!